The Milwaukee Brewers got 12 hits from eight different players in their 10-5 win over the Toronto Blue Jays. 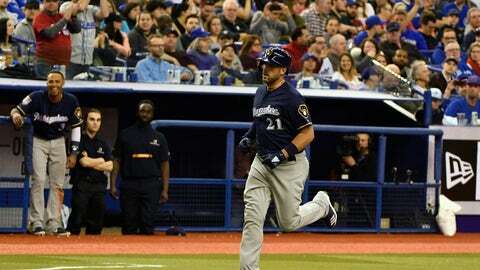 Yasmani Grandal and Travis Shaw each homered and the Brewers used a four-run eighth inning to run away with the victory. Brandon Woodruff got the start on the mound, allowing a pair of runs on four hits while striking out six in three innings. Josh Hader, Alex Wilson, Junior Guerra, Alex Claudio, Jacob Barnes and Taylor Williams also pitched for the Brewers.